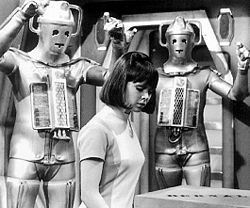 WHEEL MEET AGAIN: A promotional photo from The Wheel in Space showing the Cybermen and new companion Zoe (Wendy Padbury). A NEW CGI trailer for classic Doctor Who story The Wheel in Space has become an internet hit. The clip imagines what the sixties adventure would have looked like if made by Alien director Ridley Scott. Lasting two minutes, the “creepy” black and white animation features scenes of popular Who foes the Cybermen set to the soundtrack of Scott’s acclaimed 1979 horror film. The video has had thousands of views on YouTube since being uploaded on New Year’s Day and shows how far reconstructions, or ‘recons’, of missing Doctor Who episodes have come. Animator Iz Skinner made the trailer as a ‘taster’ for a forthcoming recon of the Patrick Troughton story and says she was trying to reinstate the “scariness” of the episodes. She said: “When I read that Ridley Scott had actually worked for BBC Television in the 1960s, I thought it would be fun to imagine how he might have made a trailer for this great story. Originally broadcast from April 27 – June 1, 1968, only episodes three and six of this six-part story are currently held by the BBC. Telesnaps and fan-made audio recordings of all episodes, however, do survive and have been utilized by Iz and fan-group Loose Cannon Productions to recreate as much as possible the look and feel of the show. “I do think a semi-photo realistic episode is entirely doable,” added Iz. “I say semi-photo realistic because for the most part I’d say that you would still know it was CG, particularly with the characters. READ ON: Iz Skinner has also made a CGI trailer for Doctor Who story The Web of Fear – Doctor Who trailer recreated with CGI. There is a full set of telesnaps to all six episodes of The Wheel in Space over on the BBC’s Classic Doctor Who website. I’ve just added a feature looking at the brilliant work of Loose Cannon Productions, which makes highly-regarded reconstructions of missing 1960s Doctor Who stories. Their latest release, “The Evil of the Daleks”, is available now and is definitely worth checking out: It’s the closest you’ll ever get to seeing the story as originally broadcast. Click here to go to the article, with links to the LC website.